A chance to get away, to hit pause on life’s busyness & set aside obligations, to spend time with yourself, to rest and reflect and reconnect within, to listen and attend to your soul … a chance to just be. Retreat to the hillsides of Ojai for a rejuvenating weekend of relaxation, yoga, hiking, self-care, healthy cuisine, laughter and connection. Entrenched in nature on 23 acres of private countryside, a picturesque estate awaits along with the invitation to realize the timeless state of being. Arrive Thursday between 3-4:30pm, look around, settle in, meet and great friends you will know for a lifetime. Meagan will lead a special evening class at 5:30 pm designed to help you ground and unwind, followed by a special half-hour Yoga Nidra (guided meditation) practice. Followed by a communal dinner in the fresh open air. Awaken Friday morning to the smell of jasmine, citrus and sage, and enjoy a light breakfast at your own pass. Fresh coffee, tea and breakfast items will be out from 8-9:30am followed by an in-depth two-hour practice. Post lunch, spend the afternoon lounging, hiking, soaking and discovering Ojai. Arrive back on the property for an evening astrology, yoga and meditation followed by dinner. And after a heavy night’s sleep, we will do the same on Saturday. Sunday will be our farewell practice and brunch before our departures. You’ll then have the afternoon to go exploring and I know many of you will want to go wine tasting around Ojai so plan accordingly. This retreat is all about YOU ~ intentionally designed to give you insight into your own nature and deepen your connection within. Throughout the weekend you will learn more about your unique structure in relation to the poses, as well as tools and techniques for calming the nervous system, releasing tension, becoming present, experiencing wholeness, and tapping into your intuition and the innate wisdom of your own body. Secluded at the end of a quarter-mile road, the private retreat estate is located on one of Ojai's unique avocado and citrus farms. 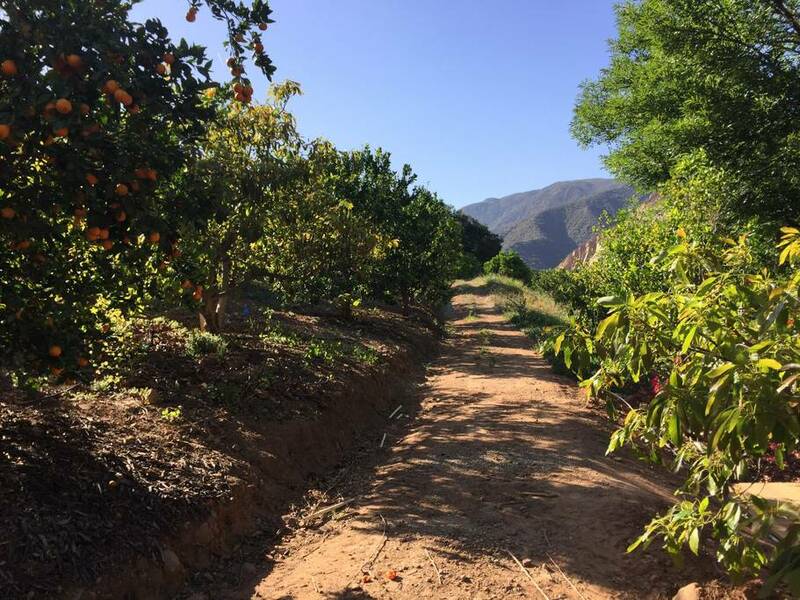 The property itself has about one mile of beautiful trails on the edge of Las Padres National Forest with expansive views of the Ojai Valley to the east and Matilija Dam to the west, and many more trails all around. While Ojai’s tranquil, natural retreat setting and sense of place is perhaps its greatest healing feature — this peaceful estate, where privacy is at a premium, is the perfect complement to those seeking a quality getaway providing an ideal and intimate setting. *All prices above are on a per person basis. A non-refundable $350 deposit is required to hold your space on the retreat (payable by personal check or through venmo). All payments due in full by April 30, 2018. To register, please email Meagan at msmeagan26@gmail.com. This will be a renewing experience that will bring you back to a state of being and most grateful self. You will leave feeling more at peace with yourself, grounded in who you are and inspired to continue your journey. Join us!